The new four-year fisheries agreement between Russia and Morocco was signed officially yesterday. The agreement had already been provisionally applied since December 2012. The agreement was signed at the second Halieutis Conference in Agadir. Moroccan Minister for Fisheries, Aziz Akhannouch and the delegate of the Russian Federal Agency for Fisheries, Constantine Dikin, inked the text. Russian vessels have been fishing in the Saharawi waters since December 2012, on the basis of a memorandum for an agreement with Morocco signed that time. Russian media writes that the deal allows 10 Russian vessels to fish in the “Moroccan Atlantic Exclusive Economic Zone” for the next 4 years. This would be in line with the previous agreement, which was carried out in violation of its own terms; in Western Sahara, outside of the Moroccan EEZ. 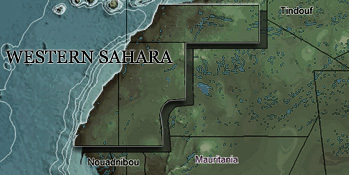 Morocco has not even laid claim to the waters offshore the territory. It would not even be able to do so under the UN Convention on the Law of the Sea, of which it became a member state in 2007. A large part of Western Sahara, including the coast, has been illegally occupied by Morocco since 1975/1979, under UN condemnation. Morocco's claims to the territory have been rejected by the International court of justice. In return for an alleged 5 million US dollars per year, Morocco offers Russia an annual 100.000 tonnes of pelagic fish, such as sardines, sardinella and mackerel. Scientific research has shown that these species are on the decline in the waters of Morocco proper, but are still abundant in occupied Western Sahara. This is supported by WSRW’s observations that the Russian fleet thus far has only been active in Saharawi waters, and not in Moroccan seas. WSRW is currently awaiting translation of the agreement.